Here is an article on Bill Clinton's visit to Banda Aceh which I thought might be off interest. I suggest we post it on the internet alongside a picture from the day. I am also planning on including it in the June edition of the newsletter. Take care and have a great weekend. Banda Aceh, Indonesia, May 30__ Continuing needs for shelter, alternative building materials and legal logging were top issues at talks between UN's Special Envoy Bill Clinton and UN agencies representatives dealing with the tsunami, including FAO Area Coordinator for Banda Aceh Jean-Jacques Franc de Ferrière. During the talks the former U.S. president directly addressed Mr. Franc de Ferrière regarding FAO's role in the rehabilitation process in Aceh Province. "FAO's core activity is and continues to be to focus on the immediate needs there in order to rebuild the livelihoods of the fishermen and farmers in the region," Mr. de Ferrière said. "In some parts of the tsunami affected areas, many farmers have already returned to their lands, but what they need now is proper assistance to help clear their land and get the soil ready for the next planting season," he added. On May 23rd seven hand tractors were distributed to officially launch the FAO distribution campaign comprising a total of 545 hand tractors, 174 metric tons of rice seeds and 1,305 metric tons of fertilizer. These inputs will allow 8,700 families not only to be self sufficient in rice production, but also on other products such as corn, soya, beans etc. 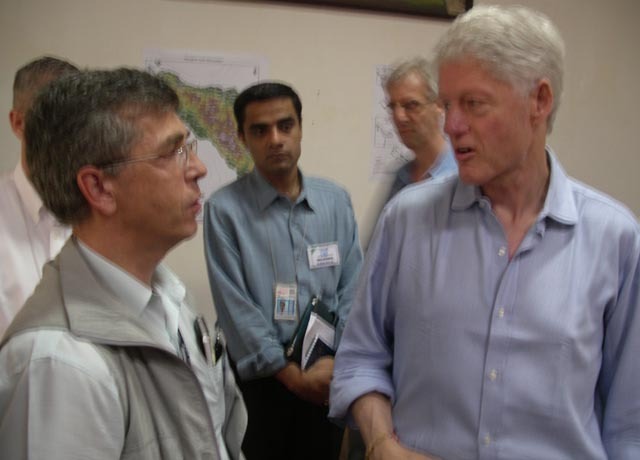 Mr. Clinton who was recently appointed UN special envoy for the tsunami recovery operation was in Banda Aceh, as part of a four-day trip to countries badly affected by the tsunami to ensure aid is being distributed effectively. Before coming to Indonesia he also visited the Maldives, India and Sri Lanka.